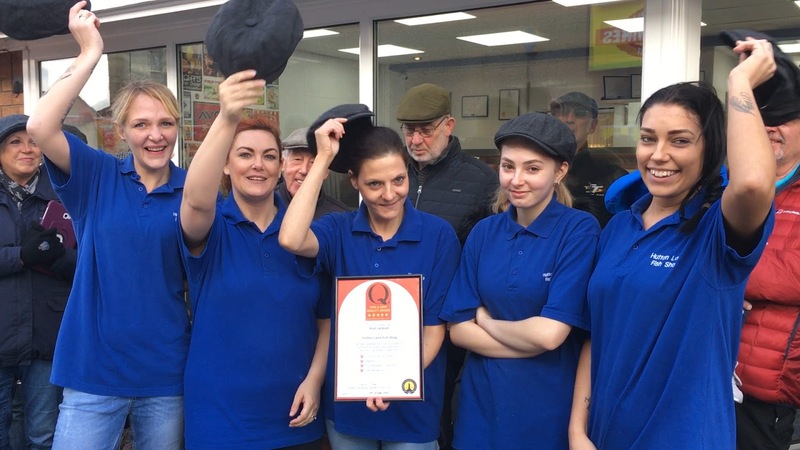 Hutton Lane Fish Shop celebrated receiving a 5-Star Quality Award from the National Federation of Fish Friers by throwing a 'Best of British' party, raising money for local children's hospice Zoë's Place in the process. What could be more British that a good ol' portion of Fish & Chips? 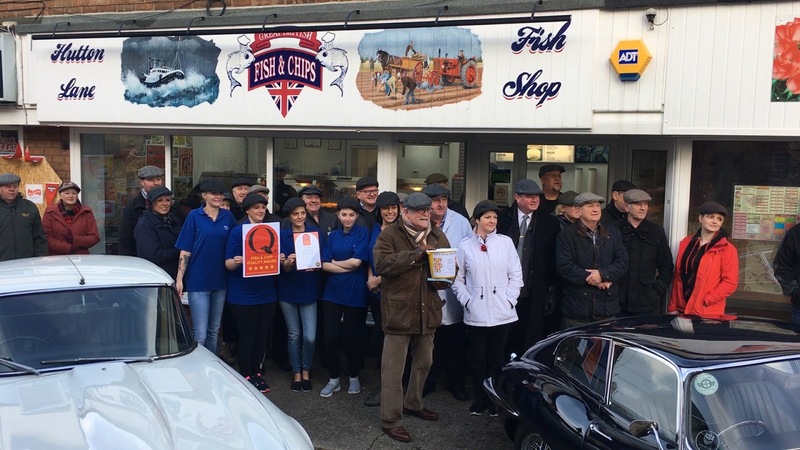 How about a group of people donning flat caps, to eat Fish & Chips on a cold November's day, standing alongside three beautiful, British made, E-Type Jaguars, and plentiful cups of Yorkshire Tea? If this sounds good to you, you'll be pleased to learn that this was the wonderfully eccentric British scene put on by proud Brit and owner of Hutton Lane Fish Shop, Alan Jackson, to celebrate the Guisborough take-away winning a prestigious 5-Star Quality Award from the National Federation of Fish Friers (NFFF). Inviting patrons to brush off their finest cloth cap and join the team in celebration, guests were able to enjoy an award winning lunch of the finest Icelandic cod, golden Chips, a battered sausage and a side of mushy peas, with the added reward of knowing they were supporting local charity Zoë's Place at the same time. "We wanted to help a local charity. so we asked our sponsors to give us some potatoes, some fish, some beef dripping... all the staff are working for free... so every single penny is going to Zoë's Place. "It's a wonderful thing for charity and British people getting together." Representing Zoë's Place at the event was Mike Mohan, who was understandably delighted by the support shown from his good friend Alan and the local community. 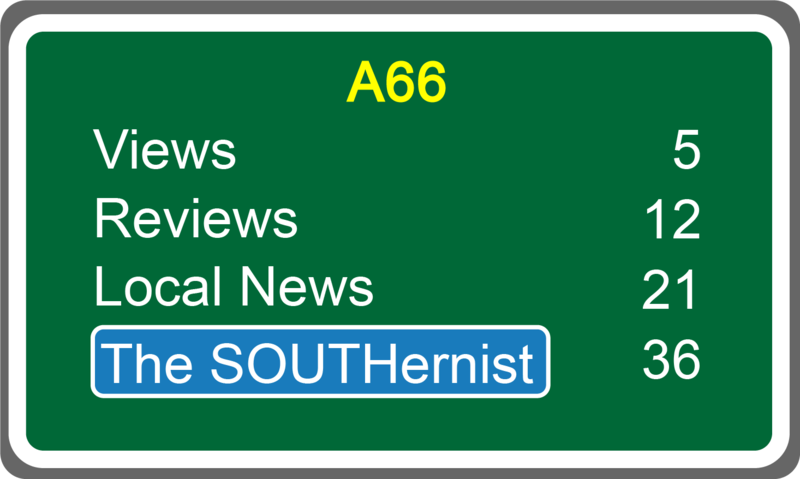 "I'm really pleased that Alan has put this function on today. "It takes about a £1.5 million a year to keep it open. "We get a small donation from the government and local doctors, but otherwise it's all charity, raised locally and people are so generous." Named after the Greek word for 'gift of life' the charities three premises in Liverpool, Middlesbrough and Coventry provide invaluable respite and palliative care for the families of babies and young children with life-threatening or life-limiting conditions. Also on hand at the event was Hugh Mantel, Regional Director and assessor for the NFFF Quality Award, who has, "the dreadful job of having to eat Fish & Chips." "Alan is very particular about his fish. "He uses a 32+ ounce fillet, the most expensive of fillet... but what that gives you is the loin, the most succulent part of the fish." That Alan is so particular about fish is no surprise when you learn that prior to embarking into the Fish & Chip trade, he was "involved in fishing from boats" for as long as he can remember. "I bought a Dory 25 years ago, then I got a Tremlett which was slightly bigger, then ended up with a Swiftcat boat - one of only two in the UK - I used to go tearing about the North Sea catching cod." 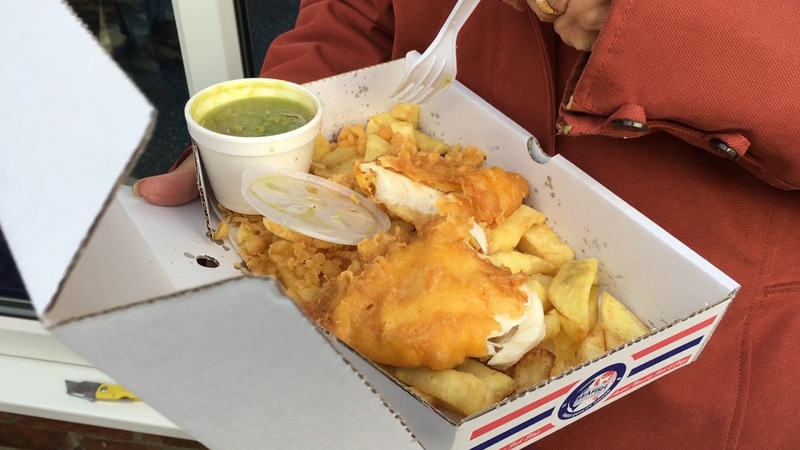 Fish, chips and charity - what a fantastic combination! This sounds like a brilliant event and I'm so glad that the proceeds went to such a great charity. Will you update us with the amount that was raised?